Max Damage is one of Microgaming’s latest video slots. It is based on the hit game of the same name. 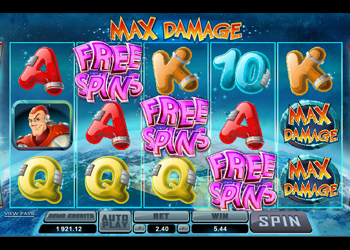 Max Damage may not contain the sharpest graphics (which you might expect from a modern Microgaming title), but it does contain a rather generous helping of special features, paylines and cash prizes. The slot is also about a superhero spaceman who destroys alien invaders with ease, inflicting max damage on them along the way. Read more about Max Damage, in our online slot review. As you have probably noticed, Max Damage is played over 5 reels, with a total of 243 ways to win present as paylines. This means that symbols count no matter where they appear on each reel. You cannot wager on each line individually, though, this is to be expected. Coin sizes stem from 1p up to 5p, whilst between 1 and 10 coins can be bet per line. Ultimately, players are going to be wagering anything from a low of £30p per spin, up to a high of just £15 per spin in this slot. The Max Damage logo acts as this slot’s wild symbol. It is also one of the better paying icons in the game. When a wild appears, it can substitute itself for all other icons in the game, with the exception of the scatter icon. Wilds appear stacked on all of the reels in the game, which is really going to brighten players’ moods. Max Damage’s scatter icon is the UFO. When this alien vessel lands 3, 4 or 5 times in any positions on the reels, the player will trigger a free spins bonus game. Players can win up to 120,000 coins in this bonus game. Let’s find out more. Once you have triggered the free spins bonus, you will notice that you get 15 free games. All winnings which you acquire in this bonus round will be multiplied by 2x their normal rate of pay. Yes, this means that double winnings are available. 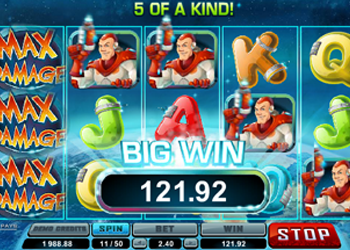 At any point in the free spins bonus, an alien spaceship may appear on each reel. Max will then blast them away and cash prizes will be paid out. Alien spaceships which have been blasted away will also become wild symbols, which can see players win even more cash during what is an already pretty prosperous free spins game. Fancy playing Max Damage and pocketing a bright bonus today? You can, with Guts Online Casino. This intergalactic Microgaming title is available to play at Guts Casino, and if you sign up there as a new player today, you can claim a pretty nifty £300 welcome bonus, when you make your very first deposit. Moreover, you can also claim a rewarding 100 free spins on the Starburst video slot. Galactic slots are all around at Guts, so why not claim some incredible and astronomical bonus offers, too?